The most popular Italian dishes are known for simplicity, and with just a few flavorful ingredients, especially of good quality, the best food is within reach. In keeping with tradition, this soul-satisfying pasta with Prosciutto and peas dish is a perfect balance of taste and texture. Butter and truffle oil heighten the flavor, while the peas offer color and freshness. Sweet, vibrant and crisp basically sum up this recipe. 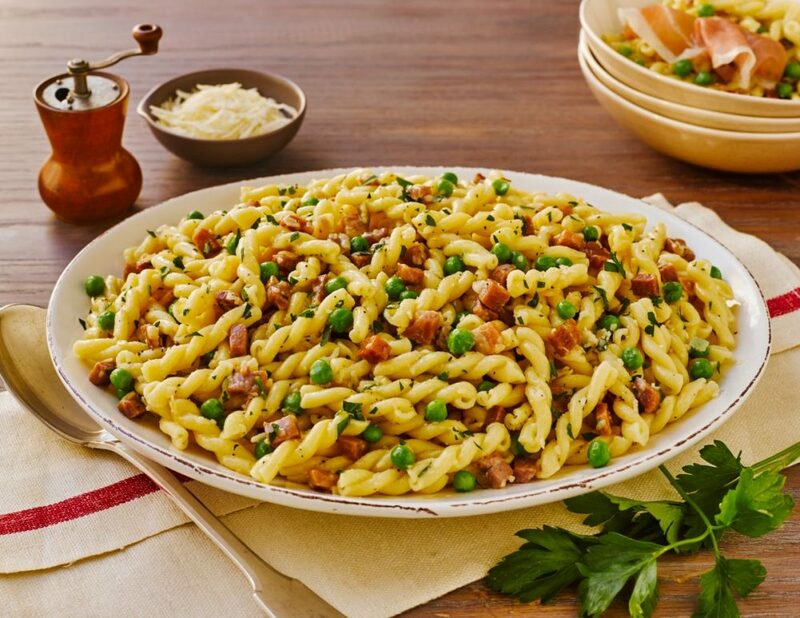 Pasta with Prosciutto and peas make a strikingly beautiful presentation, while delivering an equally delectable taste profile, and tons of rave reviews. In a 1 quart pot, bring water and salt to a boil. Cook pasta until almost al dente (9 minutes). Drain pasta well reserving 1 cup of the cooking liquid; transfer pasta to a large bowl. In a large skillet over medium-low heat, melt 2 tablespoons of the butter. Add shallots, sautéing and stirring frequently, until translucent, about 3 minutes. Add peas and diced Prosciutto, stirring often, until prosciutto begins to brown, about 5 minutes. Add cooked pasta, chicken broth, and 1/2 cup of reserved cooking liquid to the skillet. Cook until the pasta is al dente and the liquid has reduced to coat the pasta. Add the truffle oil and remaining 4 tablespoons butter; cook and stir until the butter has melted. Add more reserved cooking liquid if the mixture seems dry. Remove pasta from heat; stir in Parmigiano-Reggiano and parsley; add salt and pepper to taste. Divide mixture among 4 pasta bowls; top each with a slice of Prosciutto di Parma. Serve warm.